Please check our MUSEUM CALENDAR frequently to find out about upcoming events. Or click this FACEBOOK link below to Like us on Facebook. We are closed on Easter Sunday, April 21, but the museum grounds are always open during daylight hours, come in the side gate, it is closed but unlocked. 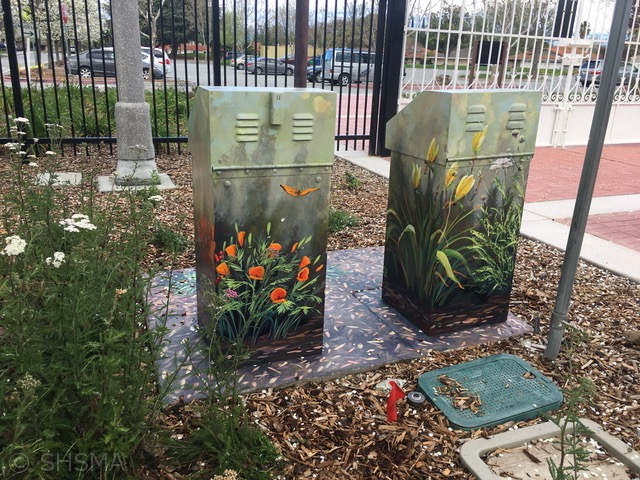 Recently, local artist Morgan Bricca painted the utility boxes on the museum entry path. Stop by this weekend to view them and our other outdoor exhibits! The museum will be open again on Tuesday, April 23, from Noon – 4pm. 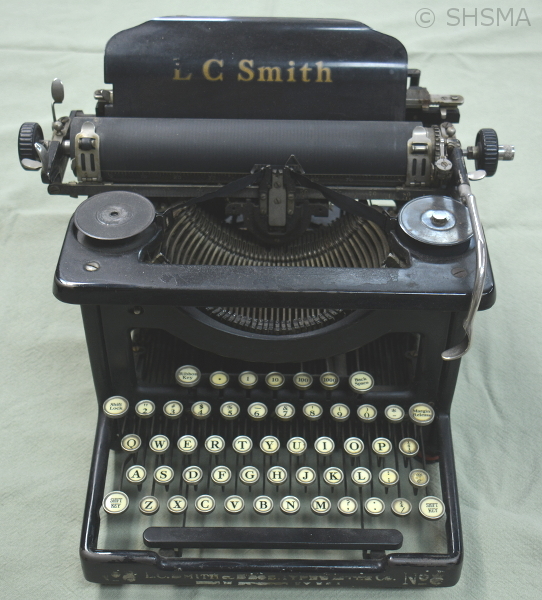 Our upstairs rotating exhibit this winter is, Communications before Technology. Much of the technology being developed here in Silicon Valley is all about communication: instant, distributable to the masses, easy. But how did people wish one another a happy birthday or let their family know that they would be visiting soon fifty, a hundred, a hundred and fifty years ago? The museum’s new exhibit will answer those questions. You will see letters written by the Taaffe twins (Mattie and Molly, Elizabeth Yuba Murphy Taaffe’s daughters) and learn how postal worker Joe Stanich hung Sunnyvale’s outgoing mail pouch on a tall crane at Murphy’s Station, the pouch to be grabbed by someone on the passing train. You will be able to refresh your memories of a Walkman, typewriters, a calculator that is NOT part of your phone, IBM punch cards, and much more! This special exhibit will be open from January 22nd to the end of May. April 27–28, 2019 – Spring Victorian Teas SOLD OUT! Sorry, we are SOLD OUT for these spring teas! Twice a year, we serve formal, Victorian teas. We include assorted tea sandwiches and sweets complete with all the trimmings. Our next teas will be in December. Reservations will be taken when we announce those dates. After the business section of the General Meeting, our guest speaker, John Kolstad, will give a talk on the history of El Camino Real, as well as the history of the bells, how the bells are made, and the fascinating story of how the California Bell Company (originally founded in the 1900s) was brought back to life. The plan had been to place one bell along each mile of the highway called El Camino Real, in front of each mission, and also at selected historical landmarks. By 1913, the goal of placing 450 bells was reached. 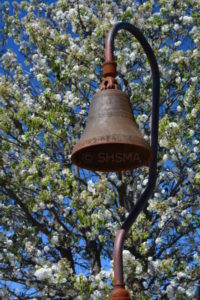 One bell was placed in front of each mission and the balance were placed along the El Camino Real highway. Since then over 586 bells have been replaced on the 101 highway. The bell gracing the new entrance to the museum is dated 1906. 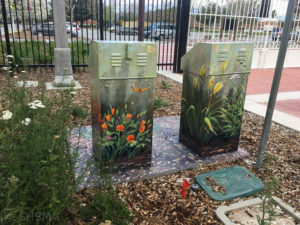 It was originally placed on El Camino Real near Mary Avenue in Sunnyvale. Kolstad is the owner of the California Bell Company. For more information go to www.saratogahistory.com or call 408-867-4311. The lecture is free and open to the general public. 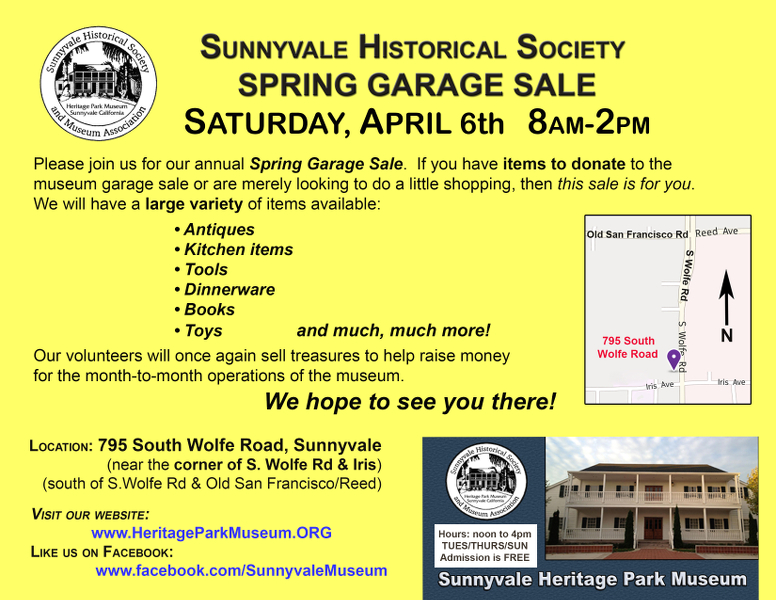 The mission of the Sunnyvale Historical Society is to preserve, teach, and protect items pertaining to the history of our community. The Museum is looking to expand in order to build a much-needed historical research library and create a permanent exhibit on the Blue Cube and Lockheed Missile programs – both important parts of Sunnyvale history as well as national history. Please contact the museum if you have momentos or stories to share. 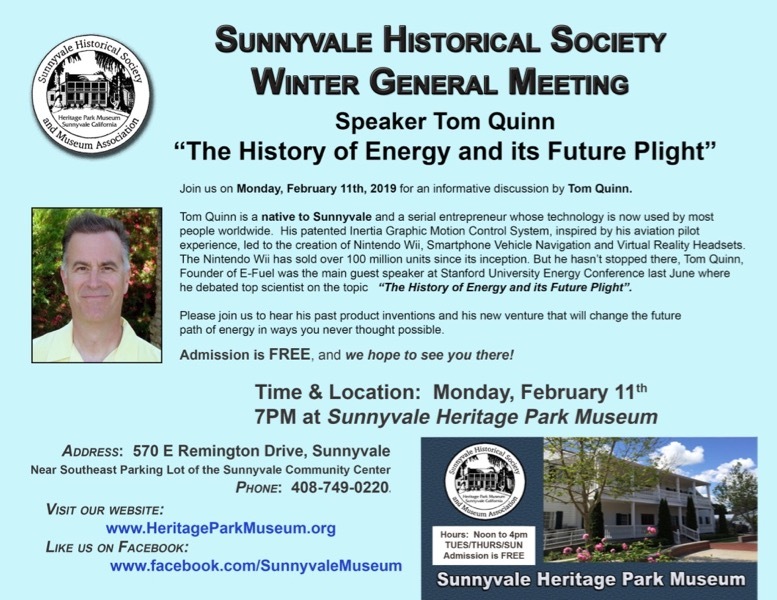 The Sunnyvale Historical Society and Museum Association has taken into consideration how this project may temporarily impact Orchard Heritage Park. 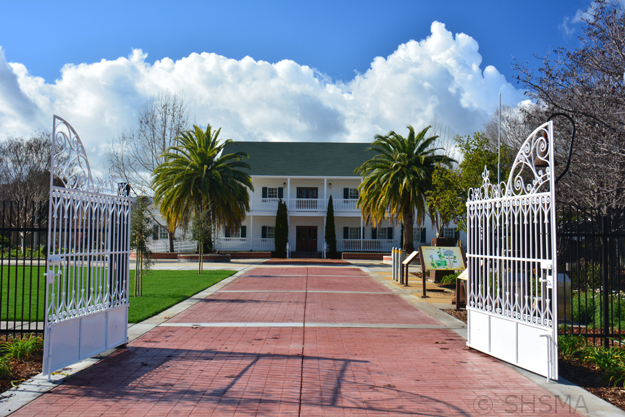 The Orchard, located next to the Heritage Park Museum, is respected as a valuable part of the community and Sunnyvale’s living history. 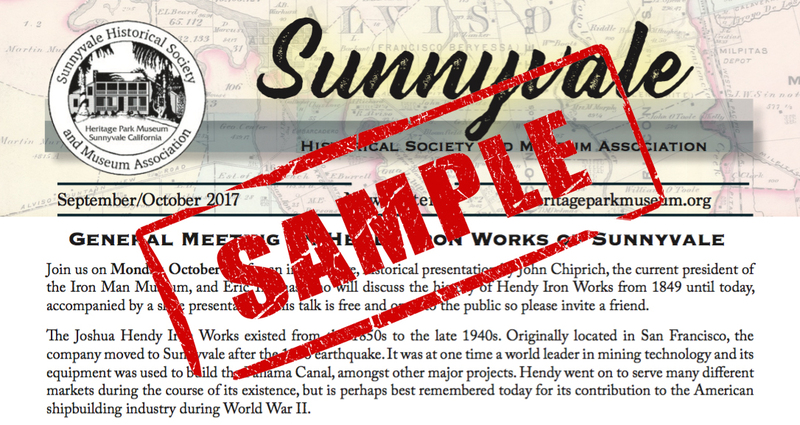 Preserving the integrity and heritage of The Orchard Heritage Park, and maintaining the ten-acre site is important to The Sunnyvale Historical Society, so it can also be enjoyed by many generations to come. The 1600 sq. ft addition may impact 6 to 10 apricot trees, all of which will be replaced in other areas of the orchard. There will be no net loss of trees. A new, grand entrance has been created to welcome visitors to our museum building. Delays in construction have pushed the celebration to 2019, so please join us on September 28th for a dedication of the new outdoor exhibits and a “Ten Plus One” anniversary event. Click Here to see the 2018 demolition and remodeling photos. 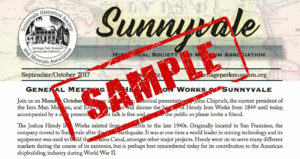 Your membership to the Sunnyvale Historical Society and Museum Association helps to support our daily operations. Members Benefits include, our members-only Newsletter, special invitations to members-only events, and a 10% discount on Museum Gift Shop purchases. You can become a member online (below) or come into the museum Gift Shop. Click image to the left for a full-color example newsletter issue that you receive every month as a society member. Members can decide to receive this full-color PDF via e-mail instead of via US Mail. If this is a Gift Membership, add the recipient info in the Add a special message Section when completing the transaction on PayPal. 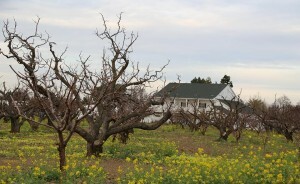 In 1994, the City of Sunnyvale preserved 10 acres of apricot trees to celebrate the important contribution of orchards to the early development of the local economy. The museum opened next to the orchard in 2008. Click the photo for views of our apricot orchard throughout the year . 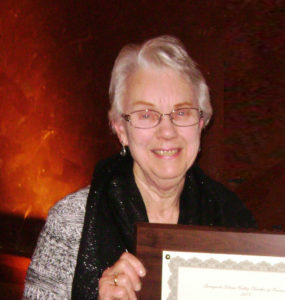 August 19, 2017 passing of Jeanine Stanek, the Sunnyvale Historical Society’s Chief Archivist. Her dedication to history, her positive attitude, and her endless energy was an inspiration to us all. She will be greatly missed. Click Here for the Museum Director’s memories of Jeanine. Here is a photo from February 2014, of Jeanine receiving the 2013 Murphy Award for Lifetime Community Contribution. I worked in the STC from Jan 1963 t0 Sept 1992. I was a Charter Member of the 6594th Aerospace Test Wing Training Team. I also taught Data Handling Equipment Maintenance Courses at both Hawaii and Kodiak Tracking Stations. I conducted over 250 classes and trained over 2500 personnel. I also worked as the Mission Director’s Technical Advisor on the GPS and DSP satellite programs. I conducted Orientation tours thru the Satellite Test Center and the Blue Cube. Our training office was the first office to open in the Blue Cube. Thanks for your comment, Mr. B. I’ll add your name and email address to our list of people who have reached out to us for help in creating an exhibit on the Blue Cube. Hi, my name is Don Fair, I lived in Sunnyvale from April of 1967 until October 1968 after being recruited by Lockheed Missiles & Space Co. following graduations from DeVry Institute of Technology now DeVry University. I worked in the Lockheed manufacturing division worked on both the AGENA spacecraft, and POSEIDON SLBM programs. After departing Sunnyvale in October of 1968 for New Hampshire to continue work on the AGENA spacecraft for the 6594th Aerospace Test Wing as an Operations and Command Control Officer, From a remote satellite tracking station still maintaining contact with the “Blue Cube”. I supported over 127 combat missions associated with the CORONA, GAMBIT, HEXAGON, DSP, VELA and IDSP (USAF/NRO reconnaissance programs). I have many photos and stories of those programs dating back to the 1960’s and 70’s. I am also working with the Smithsonian Air and Space Museums in Washington, DC and often run bus trips to those museums as tour guide. I teach high school and college students about the early days of space exploration. 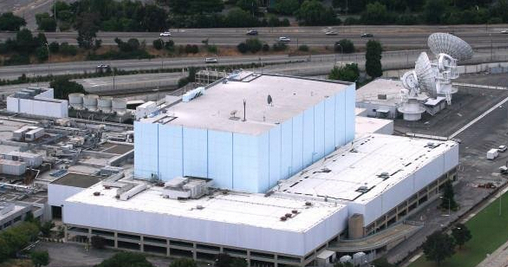 I worked at the Cube in Security from 1987 – 1990. I don’t really have much of any stories as even though I was inside every day all I got to see were the hallways as each MCC (Mission Control Center) was only open to the people that worked in it and unless you had a need to be in one, you wern’t. I’m guessing that the janitorial staff were the only ones that actually made it into multiple MCCs. Actually, many of the janitorial staff did the job part-time and worked elsewhere in the cube, as everybody needed a security clearance and it was easier for the janitorial company to hire a moonlighter vs. pay for the clearance for a new employee. One persistent rumor that I heard was the when you worked in an MCC that you had to sign a waiver that if you had a medical emergency that you were okay to rely on whatever aid your co-workers could provide you, until they could get you out of the MCC. This was due to the fact that Sunnyvale Fire did not have clearances and were not going to be allowed in. Finally, I have a Sunnyvale AFS badge that was given to me when our badges were changed out to Onizuka AFB. I know it’s not much, but let me know If you would like to have it for your collection, and I would be more than happy to send it to you.